Most beaches here are visited by locals on weekends in the afternoon. 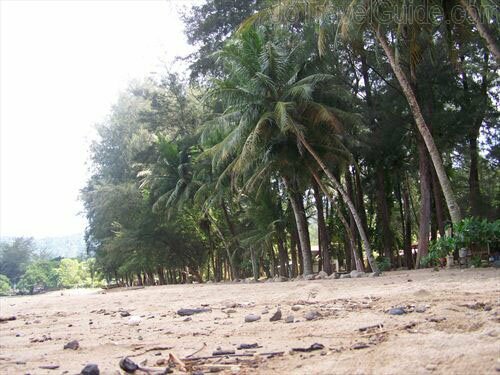 The typical beaches in Padang or West Sumatera are surrounded by coconut trees. Some beaches have boat rental facilities to cross to the other islands, such as Sikuai Island, Mentawai Islands or coral islands as in Air Manis Beach. Prices really vary, depending on negotiation (note: prices/fares stated below are subject to increase due to fuel price hike in 2013). You can always ask travel agents in Padang to arrange a boat rental, which is sometimes considered easier. People doing sunbathing on the beach are a rare thing to see here. Most locals visit their beaches to swim and they wear clothes while swimming or playing on the water (especially the women). 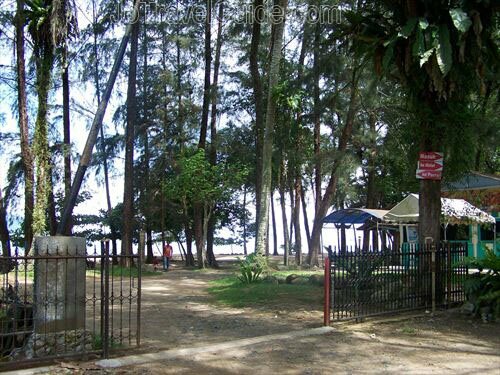 In some beaches, visitors can see or even join local fishermen fishing, other beach activity can be done here is just to relax under the coconut trees. Carolina beach or also known as Bungus Beach is rather a quiet beach decorated with brown soft sand and surrounded by lines of coconut trees. Most local tourists visit in the late afternoon or on weekends and usually they bring their own mats and food. 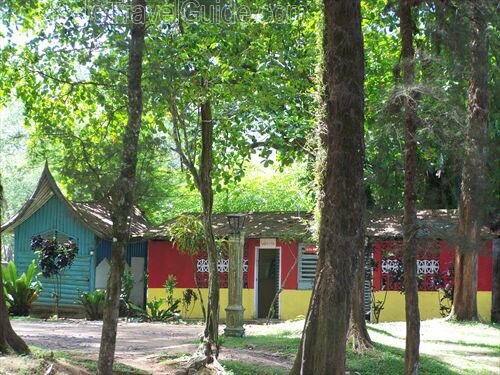 What they normally do is just to relax, hiding from the sun under the coconut trees while enjoying their food. A number of street vendors are also available here. They sell one fresh coconut for about Rp. 5,000 per piece. Price here depends on the size of the coconut and it is bargainable. If you don’t have your own mat, there are mats for rent, one mat costs Rp. 5,000. There are local fishermen too in Bungus or Carolina Beach. 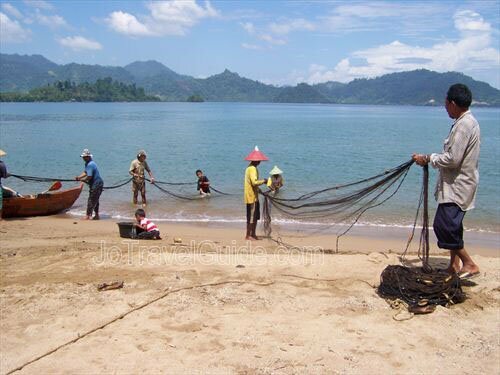 You can join with them catching fish, if you like to do so. Other thing can be done at this beach is renting a boat to Cubadak Island, Sikuai Island, Pagang Island or a few coral islands nearby. Usually speedboats are used to go to these islands. A speedboat has a capacity of 4 to 6 persons and it takes about 45 minutes to reach Sikuai Island. A speedboat rental to Sikuai Island costs about Rp. 500,000 to Rp. 600,000. While renting a speedboat to Cubadak Island will cost you about Rp. 800,000. Prices also depend on negotiation. Should you need a hand, the beach keepers at the entrance gate would be able to help you out. Click the picture above for more and bigger photos of Bungus Beach/Carolina Beach. 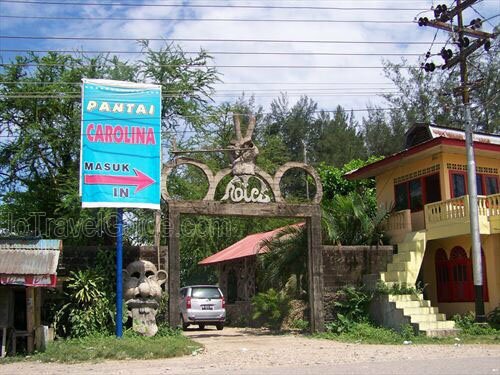 On your way to Carolina Beach from Padang, you will see an old lighthouse which was built during the Dutch colonial. From the top of this lighthouse, people can see Teluk Bayur or Bayur Bay, Bungus/Carolina Beach, and other small islands nearby. Teluk Bayur is the main port of Padang, where ships from other parts of Indonesia docked in. Goods are also being shipped in and out of the Province at this port. It takes about half-an-hour from Padang to reach Teluk Bayur port. bisa minta no hp receptionst nya juga? rencana mau nginap di sana.